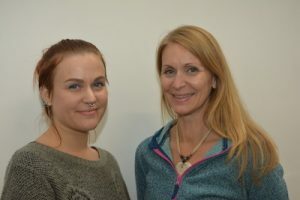 We spoke to the mother and daughter entrepreneurs, Juliet Lynn and Hayley Guerrier, behind the new exciting venture The Eco Collective. Based in Christchurch, Dorset, The Eco Collective is on a mission to become the go-to-place for vegans and ethical shoppers for all their groceries, household and personal care products. They told us about the journey in setting up their new business, and the help that they received from Outset Finance and GetSet. Juliet, having taught IT previously, came up with the idea behind The Eco Collective. She says that she wanted to create this business because she did not think that anyone else would. She felt that it was something that was needed in the area where she lives – Christchurch/New Forest and there would be a demand for it. She said “I felt that if I didn’t do it nobody else would!”. Hayley had always been inspired to run her own business, but had previously had difficulty coming up with an idea what would be commercially viable. She has a background working in supermarkets and restaurants, but when her Mum came to her with the idea, she thought that this was the right venture to join her in. The Eco-Collective is about making it easier and more affordable for the people to purchase products that have been ethically produced. The product range is 100% vegan and largely organic, including many fair trade and sustainably produced products. Customers can obtain food products, household products and personal care products. In summary – everything that they could get in a supermarket, with the big difference that the Eco Collective products have a basis in sustainability and ethics. A large proportion of the products are made in UK. 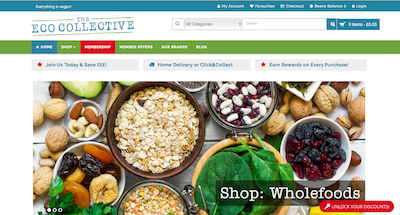 In fact, their brand new website (www.ecocollectve.co.uk) even has a filter so you can select UK businesses along with other filters such as organic, gluten free and FairTrade products. The Eco Collective is also helping start-up and independent companies in providing a distribution outlet for their products. A key market for The Eco Collective is the general public – specifically those people who will be concerned about what they purchase, where it comes from/ contains and impact on the environment as well as on their own health and well-being. Another customer segment are local cafes and restaurants. Juliet explained that this segment are becoming aware that the vegan population is growing, and therefore the demand for vegan options on their menus is also growing. 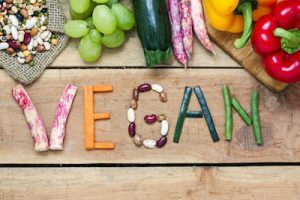 Many do not know how to cater for vegans, and so the Eco Collective is advising them on building their menus and also with sourcing relevant products. Hayley explained how a friend recommended GetSet and Outset Finance to them. When they found their new warehouse in Christchurch (and fell in love with it), they made contact with Outset Finance who helped them obtain a Start-Up Loan, which enabled them to secure their new premises. They told us that if they had not received this help, they would have had to run the business from their garden shed. This would have seriously limited them in the size of their operation. They also had help from GetSet, where via a series of 1-2-1 meetings, they obtained help to refine their business plan. The GetSet advisor gave them ideas that they had not thought of. They plan to attend some of the free GetSet Marketing Workshops in the future also. Hayley and Juliet want The Eco Collective to become a well know brand and the go-to-place for vegan products. They also have a vision for their Christchurch warehouse location to become a local hub, where people can come to pick up their orders, use it as a social space, and come to get a coffee. They are also planning to rent out some of the space for talks and events. They want to be a local hub at the same time as servicing customers up and down the UK. “Be prepared to change what you think you are going to do. Have your idea, have your goals, have how you think it is going to be – BUT be prepared that once you actually start, you may have to think on your feet and change things”. Speaking with Sarah from Dorset Marine Training (www.dorsetmarinetraining.co.uk), its clear how passionate she is about boating. She has always loved being on the water, starting boating when she was just 6 years old. 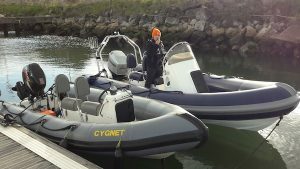 The mantra of the company is that they want to enjoy being out on the water and to enable other people to enjoy being there too. Sarah and her life and business partner, Dom Coleman, both became watersports instructors working freelance, and then decided to start their own business. They established Dorset Marine Training in Spring 2017. 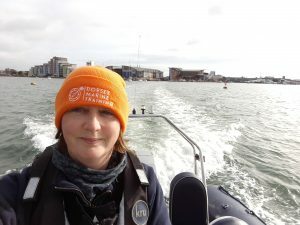 “Our aim is to make people love being out on the water as much as we do!” said Sarah, Co-founder. They train people to drive powerboats or motorboats, and they also teach the full range of supporting courses, e.g. navigation, online courses required for licenses or commercial qualifications, marine radio (VHF). 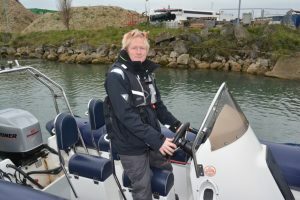 Their practical training can take place on their clients’ own boats, or they offer training on Dorset Marine Training boats, and the training is great for complete beginners, those looking to upskill or those just looking to hire in the future. They already have a wide variety of clients. 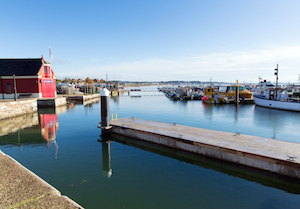 They include people with their own boat who are new to boating and might need help in first navigating the harbour and learning about boat safety. They will often take out the client’s whole crew or family for this. They may also work with people wishing to work towards becoming instructors or working commercially on the water. Other clients might be people who have had their confidence shaken a little bit, and they need some training and help in getting to love the boat again or those who upsized their boat. Others will train on the centre’s boats and may be new to the water, thinking of buying a boat or want a formal qualification. The majority of their customers are leisure boaters but there is a mix of commercial clients too. Some want a certificate and some just want to improve their confidence, so before any training starts, they find out the specifics of what the individual wants to achieve and then customise their training to the client’s individual needs. On the water as well as ashore they offer practical RYA courses so that their clients can achieve a certificate as well as bespoke training. Many people are looking to hire boats abroad and to do so they now need an International Certificate of Competency. Sarah and Dom’s skillsets are in instructing, so they needed some help on the business side of things, e.g. getting the word out there to find new clients, the financial sides of things and generally being disciplined about running a business. That’s where GetSet came in to help. Sarah first met GetSet at a female networking event (hosted by DWIB) at the Poole Boat show as part of the Maritime Festival. GetSet said they could help even at the beginning stages of their journey. From an initial one to one with GetSet, Sarah says that she gained confidence that their business idea was a good one and also that it was OK to love their business and idea. “Through initial one to ones with GetSet, they gave me the confidence that my business idea was a good one and to keep going”. On the practical side, she went along to a lot of the free GetSet workshops, particularly the ones dealing with social media, in which she had no experience, and was actually suspicious of to start with. Now she is on all the social media platforms and is particularly active on Twitter and Facebook. She thinks that this is helping to drive the traffic to the main website, which is essentially their shop window. Social media also allows people who did not think that they were looking for boating to find them and see that it is accessible to everyone to participate in. The marketing support and the reassurance and motivation to keep going, and that it is OK to love their business, is what GetSet provided. She says she has gained a great amount of confidence from that. The workshops gave her a regular event to go to and provided her with a constant focus, particularly important in the early stages of starting your business, which can be quite isolating. Going along to workshops also meant that she met other people who were in a similar situation to her. It did not matter that they were in different fields, they were either facing the same challenges or they could trade insight into challenges others had already been through or were facing. Their vision for the future is for the business to be sustainable as a Training Centre, and to carry on providing quality training and offer professional training in a relaxed and personable environment. Having had her first child, Erin Thomas Wong, started looking for a change of career. Before having children, Erin had worked in Television production, making documentary and reality TV shows for Channel 4. After the birth of her first baby, she realised she did not want to go back to working in TV, and started to look for a new venture. After someone told her about a jewellery business that they had started, Erin says she had one of those ‘light bulb moments’ and thought ‘Hey – I could run my own business’. She had never thought of doing that before, as no one in her close circle of friends ran their own business. Her friends and family were a bit concerned as she had been working in a lively team and now she was going to be working on her own. But she felt that it was absolutely the right thing and the idea of working for herself felt very empowering. Establishing her own jewellery company was her first experience of running a small business. That was 10 years ago and she has not looked back since! She fell in love with running her own business and set up two further businesses in London, one to provide local business meet-ups for other Mums that were running their own businesses, and another that provided venues for baby and toddler classes. However, then she and her family moved to Abu Dhabi, where her husband had been offered a new job. She found herself very isolated as she had built an amazing community around her in London, so she decided that she needed a new business. She wanted an online business so it did not matter where she was in the world. This is where “Making Mumpreneurs” was borne, and this is now her main focus. Her idea for Making Mumpreneurs was to create an online community for Mums in business, to help them feel supported on their entrepreneurial journey, and providing a feeling of being part of something where you are connected with a community of likeminded women. It does not matter what the business is or in what sector, as they are all struggling with the same issues of running a business whilst being a Mum. She set up Making Mumpreneurs almost two years ago, an online community designed to support and empower mums running their own business. She created an online membership part of Making Mumpreneurs, called “The Cocoon – a Safe place to Learn, Evolve and Grow”. The Cocoon offers masterclasses, expert advice, member calls, accountability and continual support to help the mums grow their business. Erin discovered GetSet East Dorset just before Summer 2017, at the stage where she wanted to really grow the business and to scale the membership. Her first session with a GetSet business consultant was an overall business session. She says that it was really useful to talk to someone who was really experienced about how different business models worked. She then met with one of the GetSet marketing consultants, asking for help in how to get more awareness and press interest. GetSet analysed her website and concluded that it looked ‘too homemade’. GetSet advised that since she was running an ecommerce site, where she was talking clients’ money, they needed to be able to trust her and therefore the website needed to look a lot more professional. GetSet helped her source local web developers, one of whom offered her an affordable monthly payment plan. It had not occurred to her that this was something that she could ask for. They turned around the website really quickly, with new branding, and it launched in September 2017. Erin says that had she not had the discussion with GetSet, she would have tried to carry on with the old website for a lot longer and probably would not have been as effective with her marketing. She now has a lovely website, with a membership back-end that is ecommerce enabled, providing security for herself and for her clients. Everyone has been very positive about the website and it has had the desired effect in increasing membership. She feels that everything is in place now and all she has to do is to keep on pushing with the marketing. With Facebook and Twitter accounts with over 5000 followers, her growth plan is to scale the membership by converting these followers to paid members. We visited an exciting new business in Bournemouth that has started up with help from Outset Finance and GetSet East Dorset. 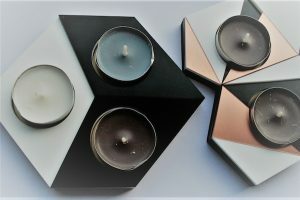 The Laser Light Studio employs laser cutting technology, initially intending to provide a range of home décor products, e.g. Nursery Room Products. The Laser Light Studio will also be running craft workshops once per month, with an aim to create a space to inspire people. When founder, Karolina Roziecka, first came into contact with a laser-cutting machine she says she loved it from the moment she saw it. She immediately knew that there were so many things that you could do with a laser cutter. She had had a disjointed journey – ended in her opening The Laser Light Studio in Bournemouth. Starting in Poland, she actually trained herself to use a laser cutter, then she become a full-time Mum and settled in Bournemouth with her new family. Having been a full-time mum for 2 years, she decided she needed to go back to work and she always knew that she wanted to continue with the same business – laser cutting. At this point, she started to look for an organisation that would help her set up her dream company. She knew how to use the laser cutter and business basics, but she wanted someone to help her. She found the GetSet East Dorset website and decided that they might be able to help. She remembers sending an email to GetSet on a Friday evening in July 2017, and getting a reply first thing on the following Monday morning offering a 1-2-1 meeting with a GetSet financial adviser. She says GetSet was extremely helpful from Day-one. Karolina explains that she had initially had difficulty with how to gain funding for her new venture and had first thought about trying to get funding on Kick starter – but she believes that would haven taken a long time. Before she was put in contact with Outset Finance, she had never thought about a business loan. She met with Rob from Outset Finance in July, and he invited her along to 2 workshops. 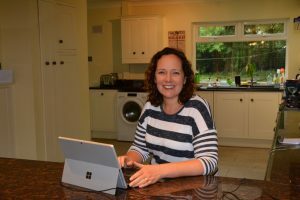 Through the workshops and 1-2-1 advice, Outset Finance helped her to write a realistic business plan for her online and bricks and mortar business. 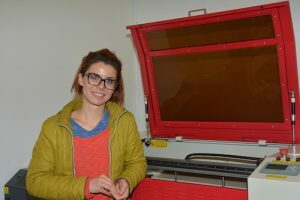 She was successful in gaining a Start-Up loan of £17k through Outset Finance, which allowed her to purchase her own Laser cutter, fume extractor and other necessary equipment and stock. She bought raw materials to build a bench and a new computer. Outset Finance also helped her to find perfect new premises, with two floors – enabling her to do design, fabrication and construction on-site. With the loan, she got 12 month mentoring with Rob. She is very grateful to have that opportunity because she feels that there is someone there that can always help her when she feels she is stuck. When Karolina found out that GetSet offered lots of free workshops, she started to book as many as possible. She attended financial ones and the marketing ones (e.g. Twitter, Branding, Facebook marketing). She found them extremely useful and she realised how little she knew the first time that she opened her business in Poland. “I would definitely recommend others to GetSet and Outset – especially the companies that are very young. The problem with start-ups is that they all have a great idea and they think that they know everything – but in reality they know very little and therefore it is very easy to make mistakes”. She also enjoyed the networking element to the workshops – where all participants exchanged opinions, ideas and experiences. Many people who came to the workshops already had their businesses started-up and others were just at the beginning. She recommends getting in touch with GetSet, or going along to the workshops and to get as much information as possible. She went to one of the workshops on branding. Before this, she had not done any customer profiling and she thought ‘Why do I need to do that? I want everyone to be my customer’. However, did define her customer profiles, and now really understands who she should be marketing to. Although only a month into her new premises, the future looks very exciting for Karolina. With her artistic background she has many ideas for her company, and will be using different sorts of media to create them. 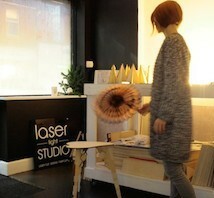 She is also really excited about her workshops and developing a creative community around The Laser Light Studio. 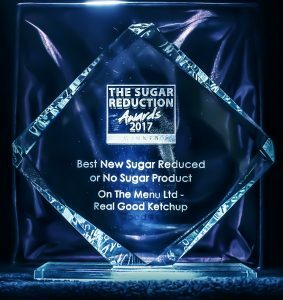 On the Menu Ltd is celebrating after winning the award for new best reduced-sugar and no sugar product at the Sugar Reduction Summit in November 2017. 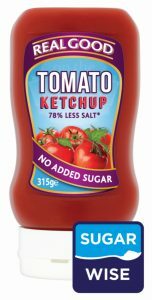 Their flagship product, Real Good Ketchup is a no-added sugar product and is certified ‘free from added sugar’ by ‘Sugar Wise’. They received this evidence-based public health prize for their new low sugar ketchup from a panel of judges, comprising dieticians and academics. This award joins the two ‘Free From’ awards they have already won, including a Gold Award from Ireland. The inspiration for the no sugar and low salt product range comes from founder, Elizabeth Jones, and her experience in having lived for the past 20 years with an anaphylactic son with allergens, and ‘can eat’ and ‘can’t eat foods’. As a small child he could not tolerate sugar, nuts or even fish. She decided to train in nutrition and dietetics to manage, how as a family, they were going to eat and get the nutrition that they needed. This process of determining what they could and couldn’t eat formed the foundation of the Real Good range. The current business focus is on the no sugar platform, driven by the rise in obesity in children; where 25% of all children in UK are either overweight or obese. Elizabeth explained that this would quadruple the risk of diabetes Type 2 in childhood or later in life. 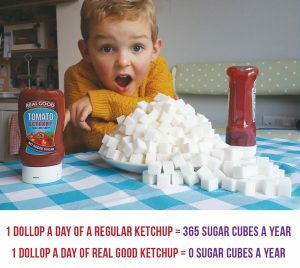 Her research has determined that if a child has a dollop of regular ketchup every day, this is the equivalent to eating 365 sugar cubes per year. Their Real Good Ketchup has been developed using a plant-based natural route, using stevia leaf. Getting a recipe right is not about just thinking about a sauce on a plate – it is all about the experience. It has to smell right, it has to look right and it also has to behave like regular ketchup – with the expectation that it sticks to the end of a chip – if you do not get the whole experience right then you will loose engagement. “Because we have got the thumbs up from children – we know that we are on the right track”, said Elizabeth Jones, On the Menu’s founder. It took around 20 evolutions to get to the right product profile. Having undertaken early trials with a primary school in Otterbourne in Hampshire they got received very positive feedback from parents and the children. With 80-90% of those who tried it, saying that they liked it and would buy it – so they had evidence early on that it was going to be a success. The testers said the Real Good Ketchup tastes more homemade and of more tomatoes. Elizabeth explained how the children were very honest in their feedback and that they embraced the flavour. Perhaps intuitively they knew that this is something that is good for them. They have received very good reaction from parents with autistic children, where sugar is not good for them. Their customers also include those who are older, with dental issues, who have been advised by their dentists not to eat ketchup due to the sugar content. They are very pleased to have found Real Good Ketchup in their local Co-op stores, and are delighted to be eating ketchup again. After 12 months, Real Good Ketchup is now in about 180 Co-op stores throughout the UK. They are also listed on Ocado and are in Whole Food stores. Elizabeth says that she gained very good insights, advice and support from GetSet and Outset Finance in the development of her business. Elizabeth explained how GetSet provide an effective introduction of all the things that you need to know when starting a business. Their marketing toolkit was current and relevant, and she received help in defining the structure for her forecasting and planning, which she is still using now. She appreciated being provided with insights, feedback and support from GetSet, and particularly in having another set of eyes on what she was doing. OutSet Finance was very proactive in supporting her businesses moving forward, particularly in providing assistance with funding. “I would recommend GetSet and Outset Finance to people thinking about starting up or growing their business –having the support of one of the local offices is very important, particularly if you have not had the experience of running a business before. They have a very good step-by-step approach for someone starting from scratch”. She explained that the package Outset designed for her was perfect for her small business with growth potential. 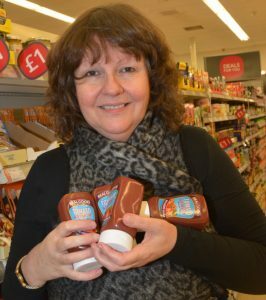 Outset Finance helped her gain funding for growth, which came at a time that they were launching Real Good Ketchup into the Co-op, and also wanted to get another product developed. They were accepted for a development loan, which Outset Finance packaged in a way that was very competitive. With this, they were able to fully exploit the growth opportunity for launching their ketchup into the Co-op and were able to go ahead with their new product development and factory trials. If they had not had this support, they would not have been able to achieve the same level of success at this early stage in their growth. The future looks very exciting for On The Menu Ltd. They are currently in early stage conversations with another large UK retailer to take their Real Good Ketchup. Having carried out school trials and also spoken with a number of hospitals, they realise there is a market for a larger format product, so they will be developing a catering range of products next year. They are going International too – having already started export of their products to Kuwait, where there are currently very high rates of diabetes. On The Menu’s customers say that they are enjoying the product, and people who were told they could not have ketchup are enjoying ketchup again. It is really for the needs of those people that Elizabeth set the company up. Over the past 18 months, YTKO Group’s GetSet for Growth East London has successfully supported 500+ businesses, created 200+ local jobs and helped clients access £500,000+ of growth finance. This would not have been possible without the support of multinational banking and financial services company, J.P. Morgan. The YTKO Group has a 30-year+ track record of advising both new and established businesses throughout its regional UK offices. The partnership between YTKO and J.P. Morgan ultimately resulted in the creation of the GetSet for Growth East London programme, which is geared toward helping businesses overcome the two biggest challenges to growth – access to finance and business development.